An international program that helps those with disabilities find employment is coming to Sault Ste. Marie. 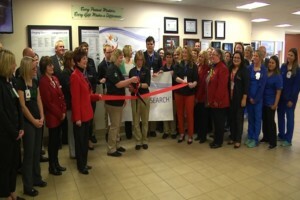 Project Search and War Memorial Hospital have teamed up to help local students this school year, and after a year and a half of planning they held a ribbon cutting Monday. Six high school students went through interviews, background checks and drug tests, just like any other job. The interns are placed in various departments in the hospital system, preparing them for the workforce. “The employment rate for people with disabilities is around 16 percent. For students that participate in the Project Search program is 70 percent or higher, for those that are able to seek employment. You can’t get numbers like that in the classroom,” says Project Search coordinator Kelli Fenton. This is the only project search program in the U.P. and the only one north of Midland.